A massive earthquake -- registering 7.0 magnitude according to the U.S. Geological Survey -- rocked Anchorage, Alaska Friday, sending debris crashing to the ground, damaging buildings and causing "major infrastructure damage," officials said. Add Earthquakes as an interest to stay up to date on the latest Earthquakes news, video, and analysis from ABC News. The quake happened about 7.5 miles north of the city, the USGS reported, and officials said residents there should brace for aftershocks. A tsunami warning was issued but later canceled. Those caught in the tremblor described ferocious shaking that "just didn't stop." It was not immediately clear if there were injuries, but Anchorage police said damage was extensive. "There is major infrastructure damage across Anchorage. Many homes and buildings are damaged," the department said in a bulletin. "Many roads and bridges are closed. Stay off the roads if you don’t need to drive. Seek a safe shelter. Check on your surroundings and loved ones." 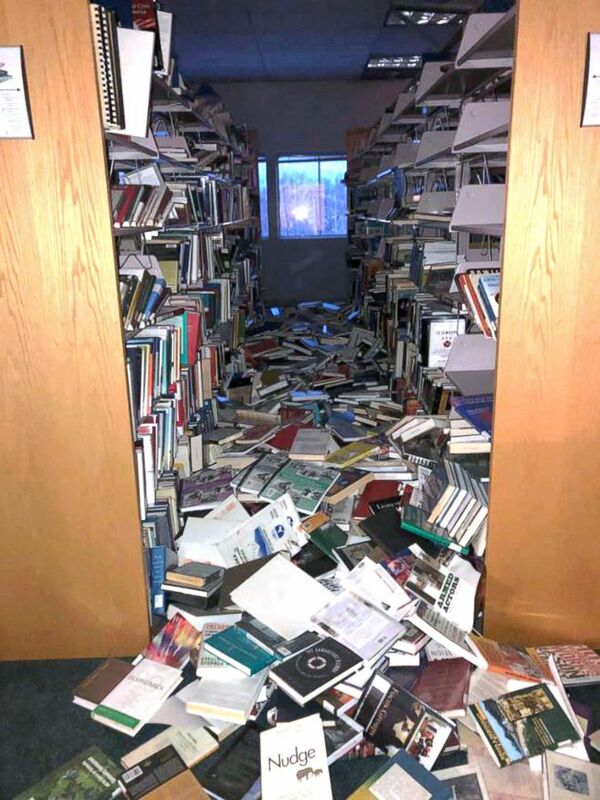 In this courtesy image books and ceiling tiles litter the floor at the The Mat-Su College library in Anchorage, Ala., Nov. 30, 2018. Dr. Owen Ala, 40, an orthopedic surgeon who was operating on a hand fracture at the time of the quake, said the quake sounded "almost like a freight train is coming through." A lifelong Alaksan, Ala said that he's lived through a number of earthquakes before but this was the largest one yet. "It definitely felt the strongest, not just by a little bit. It was by far the strongest that any of us had felt," he said. "This one you could barely stand up," he said, noting how he and his team were "holding on to the patient to make sure they don't fall off the table." 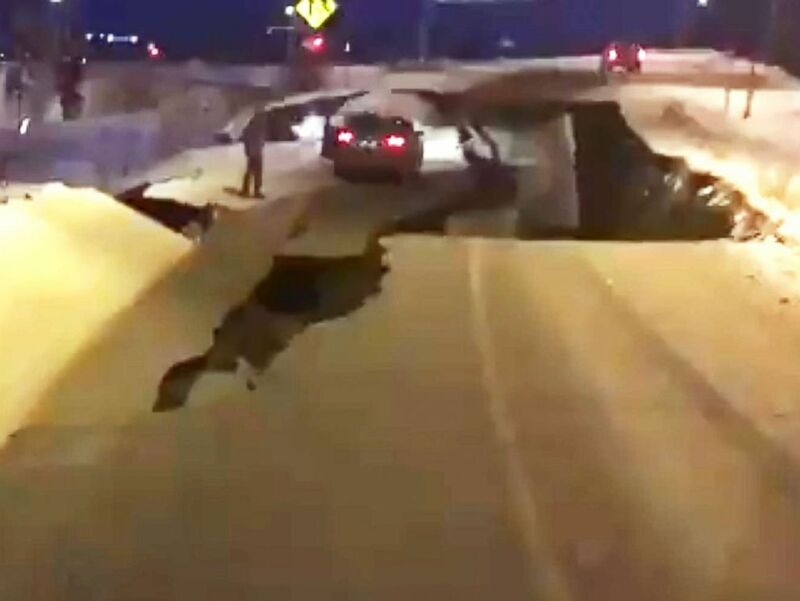 A section of a collapsed road is pictured in Anchorage, Ala, Nov. 30,2018. 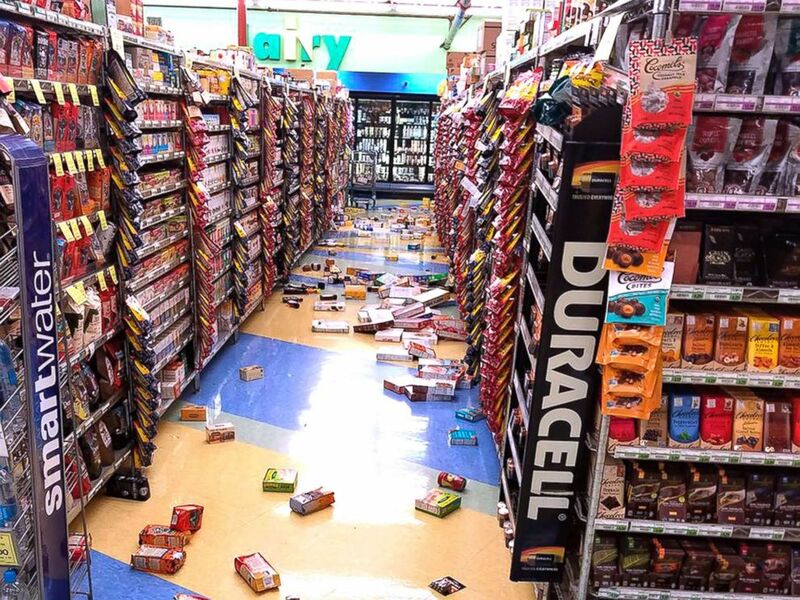 The quake knocked out power to at least 21,000 customers, according to Chugach Electric, opened up gaping holes in roads and shook buildings like toys. 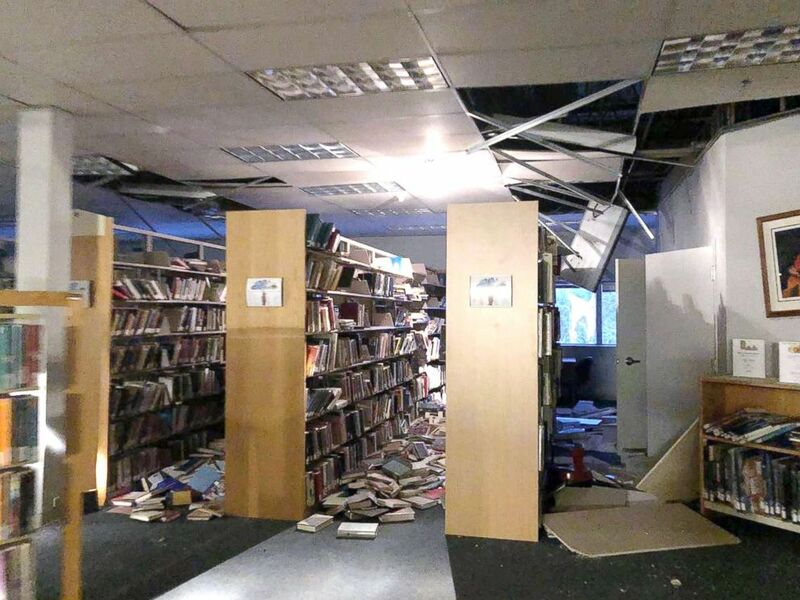 CBS affiliate KTVA experienced extensive damage to its newsroom, the station said on its website. We currently have 21,000 members without power, and will restore as quickly and safely as possible. We have all crews called in and working. If you see a downed power line or any associated hazard, do not approach it. Report through our customer service line at 563-7366. The state's former governor, Sarah Palin, tweeted that her family's home sustained damage. She posted a message that started with the prayer hands emoji, and went on to write "Our family is intact - house is not... I imagine that’s the case for many, many others. So thankful to be safe; praying for our state following the earthquake." ???? for Alaska. Our family is intact - house is not... I imagine that’s the case for many, many others. So thankful to be safe; praying for our state following the earthquake. Melody Blankenship, the business director at ABC affiliate KYUR, said that there was "this sudden shaking then all of a sudden this really loud roaring noise." "It got to the point where we got into the doorway and it just didn't stop," Blankenship said. She said that they felt an aftershock "not even five minutes later." She said that Friday's earthquake was "the strongest" she's felt in the past 35 years that she has lived in Alaska. Merchandise that fell off the shelves during an earthquake is pictured at a store in Anchorage, Ala., Nov. 30, 2018. Dr. Lucy Jones, the founder of the Dr. Lucy Jones Center for Science and Society and a former scientist at the USGS, told ABC News that "it's a quite significant earthquake." She said that the quake in Alaska was about the same size as the 1989 World Series earthquake in San Francisco, which caused landslides and widespread damage, and those in Alaska "would have felt the same sort of shaking." One Twitter user posted a video from a local grocery store showing how shelved food was thrown onto the floor. A student in Alaska posted a video on Twitter showing the lights in her art classroom shaking, and cupboards appear to have been opened due to the shocks. "Earthquake just happened right now i ’m actually shaking," the student, Alyson Petrie, wrote. The Anchorage School District posted a message to parents on their Twitter account. "We hope that everyone is safe after the earthquake. We are assessing building safety and damages now. We will update the community as new information comes in. In the meantime, parents and guardians, when you feel it is safe to do so, please pick your children up from school," the school district wrote.